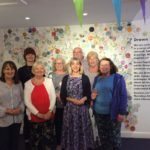 Last year our in-house drawing group Drawn Together took part in the Creative Age Challenge – a national project run by Equal Arts. 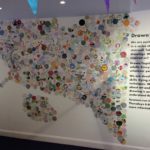 Their challenge was to create over 300 postcard sized drawings and present them as a wall on our Lower Fusion exhibition space, and to raise some funds for the group and awareness of dementia at the same time. Following on from their success the group set themselves a new and bigger challenge – to create 500 Drawings, this time on circular pieces of paper. It wasn’t easy, cutting out the circles was hard work, but when it came to creating a range of interesting and unusual images the group found their flow and produced something special. 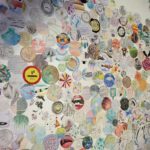 In the end the group created over 550 individual drawings which they arranged together to form a large organic form on the wall of the Lower Fusion exhibition space. The resulting collaborative work seems to have a life of its own. The drawings were made over a period of around three months by 14 artists with no particular theme but with the rule that every drawing must be made on circular paper. All media and subject matter was encouraged to create an overall impression of the variety of the work we do in the class and the interests of our members. Group leader Lesley Guy said, ‘Our main objective was to create something bigger than us, a creative enterprise that connects us as a group and in this sense we feel we have created a true community artwork’. The wall of drawings is on display in Lower Fusion until November. Drawn Together is a weekly drawing group for adults that takes place in the gallery every Thursday evening 6-8pm. The group is open to anyone with an interest in art whatever their ability or experience. We aim to create a relaxed atmosphere where people can extend their drawing skills, try new materials techniques and discuss ideas around art and culture. The Port of Tyne is proud to support The Customs House as a sponsor of projects which help young people gain confidence and skills towards employment.